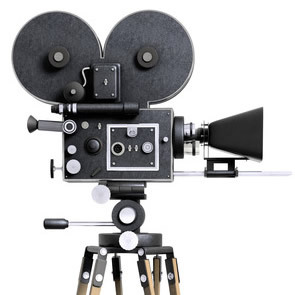 To start with I have to confess that I am fan of the Blackmagic Design products. I currently use Resolve Studio and own the current Blackmagic Pocket Cinema Camera 4k. I originally fell in love with these cameras when I picked up a second hand original Pocket Cinema Camera. The dynamic range and all tools, like focus assist, zebras and codec, made this an amazing little camera. But like all tools nothing comes ready to use out of the box. No matter what you choose to use you will modify it to suit your needs. This is the setup I used for my original Pocket Camera. Like all Blackmagic Cameras, the image quality is amazing, but the files are huge, so I added an external monitor (Atomos Ninja 2) and this allowed me to record to a SSDs. It also gave me a better monitor as the monitor on the original pocket was never bright enough for outside. I also had a collection of good Canon glass so I got a Metabones adaptor. This camera rig served me well for a few years. It was a fun thing and it taught me heaps about how to correct colour and exposure. Then in April 2018 they announced the BMPCC4K. I immediately sold my original HD camera and waited for the release. Then in April 2018 Backmagic announced the BMPCC4K. I immediately sold my original pocket camera and waited for the release. The new blackmagic pocket cinema camera – what you need. The BMPCC4K is an indie filmmakers dream. It is the size of a large DSLR, which means you can squeeze it into small places to get those interesting shots and it has the ability of producing absolutely wonderful 4K images. My new rig is great. I got a CAMVATE half cage because I didn’t want anything to get in the way of my right hand where the camera controls are located. To this cage I added a handle on the left. This has made the whole thing more stable as my hands can be more spaced in a natural position. The camera is DSLR shaped which means you can hold it on the right hand side and support it under the lens. This is a great position when you are taking a still image. But it is hard to keep the camera stable for a longer period of time with this hand position. You need a more open hand position with your hands positioned opposite each other. Some people cry that the camera doesn’t have image stabilisation (they normal don’t own the camera), this rig makes it that stable that image stabilisation isn’t needed. I then started hanging things off it. I have a Lilliput A5 monitor. This is a good little monitor and more than enough to enable me to compose my shoots. I use the ball mount that the monitor comes with to mount it to the side of the handle. It has a HDMI pass through so I can monitor the shot and put the image out to another monitor (video village style). I got a Smallrig SDD holder. This needed the hole for the screw increased and the small rig cage didn’t have ¼ inches screws like the CAMVATE has. I have mounted this to the front of the handle. I don’t mind making modifications to get the rig I want. Before this I was using an iPhone spring mount. But I wanted the cable security the Smallrig mount gives me. 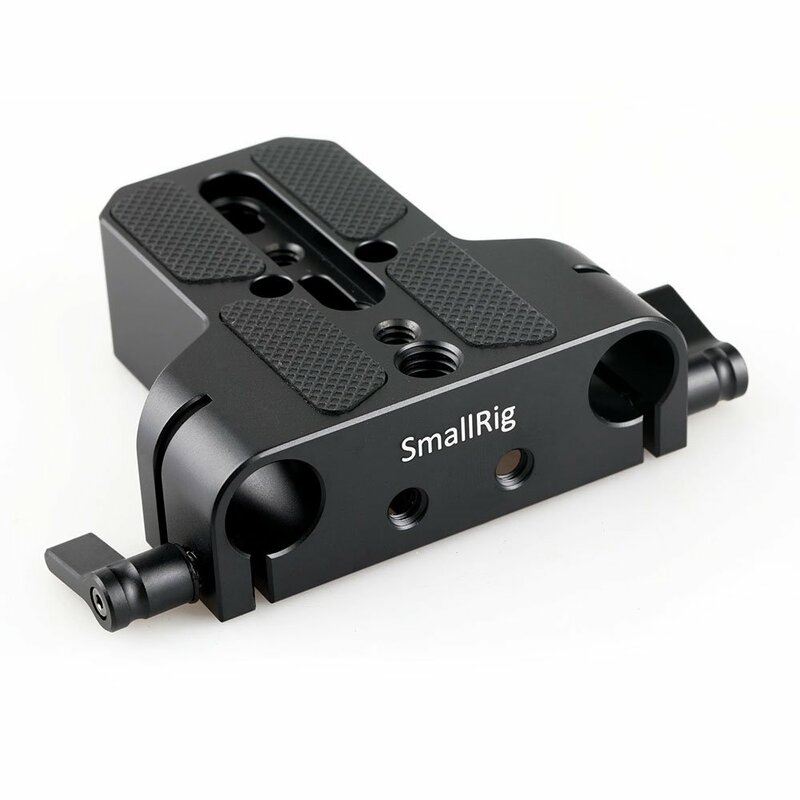 There is a Lanparte mount I am thinking of getting and replace my Smallrig mount. It appears to be more universal. I purchased a small plate to take some rails so I can mount a matte box and later a follow focus. The rails would also allow for a VLock battery plate for when I am going be out all day. 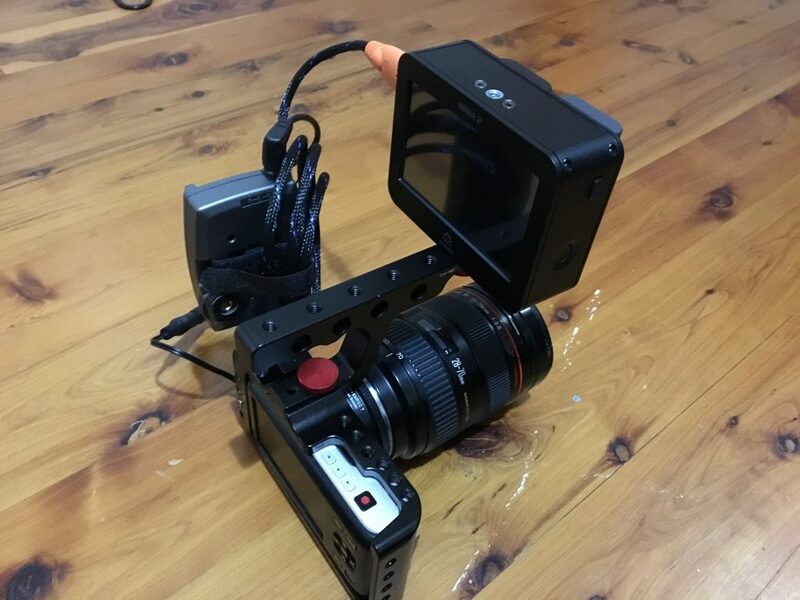 This a another bit of Smallrig gear. These guys make good quality cheap accessories. This simple rig solves all issues everyone seems to have with this camera. I think the camera was so popular and such a great value for money proposition, that people felt they had to complain. These are things I would have added to any camera. I was in love with the Panasonic EVA1 for a long time. But I can’t justify the extra money and still have issues with the external monitor etc. Battery life was about 30 to 40 mins with the original firmware. This has been extended by the 6.1 firmware upgrade. This firmware upgrade also added so many fixes and improved things that are already great. I have the iPad app so I can control all the camera functions remotely via Bluetooth. So I don’t have to be stuck directly behind the camera. So I can have lights, sound and everything crowding the camera. I can be out of the way adjusting ever function the camera has watching the outcome of the changes on a monitor. The other thing I like that I don’t think gets enough love. Is that you can apply LUTS (Look Up Tables) to your monitor. This give you an idea of what the shot will look like when it is finished. For me this makes the Blackmagic Pocket Cinema Camera an amazing camera for only $1300. All my bits and piece have added up to a few hundred more. Which still makes it such a bargain compared to all other camera and even 4K DSLRs. I have a Sigma 19 Art lens on the camera at the moment. This is a great lens for me. It is 40mm Full Frame equivalent, which is my favourite. The MFT lens mount is very versatile. I will get a Metabones or Viltrox so I can roll out my L Series Canon glass. But that is a while off. I also want to a collection of vintage glass. Just have to find the mount type that has the most choice for me. Like all the other BMPCC4K owners, I am hanging out for the Blackmagic RAW upgrade. Once this is out in the hands of BMPCC4K owners you will never see one of these camera in the second hand market. 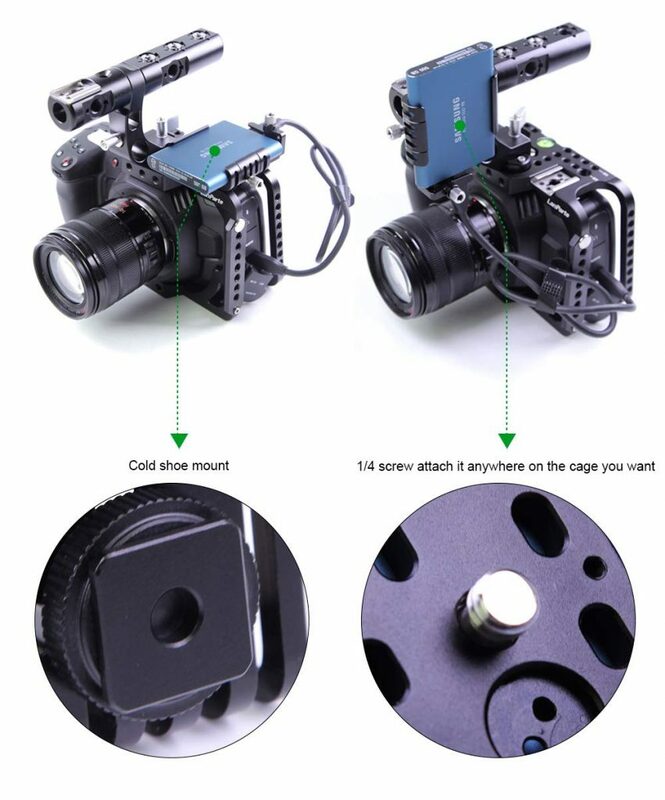 This camera will be as close to perfect for the low budget indie filmmakers as is humanly possible. I know a camera is just a tool. But this is one of those tools you just don’t want to put down. I have a friend that is a carpenter. He once pulled off a sheet of gyprock (dry wall) to recover his favorite hammer. This camera, is that kind of tool. PS: Since this was first published firmware6.2 was released and this gave the Blackmagic Pocket Cinema Camera BRAW. That right the soon to become legendary Blackmagic Raw in now available for this powerhouse of a camera.